Yep, March. Wowsers. The past month has been an interesting one for my garden, with a last blast or two of crazy heat followed by a little rain, and some cooler weather. Things got really knocked around by the heat, I lost a tomato plant (a Yellow Cherry variety) and three bean plants, a heap of young zucchinis withered and dropped off and my volunteer pumpkin failed to set fruit, nearly carked it then decided to start putting out new growth again. I'm just about ready to pull it out actually, but I find it so hard to pull out something trying so hard to grow - I'm a softy. My hodge-podge little potted garden has been growing well, I found putting trays of water under them to be essential to get them through the day. The Pineapple Sage and Bush Basil will need to be repotted separately or put in the ground soon - I'll take some cuttings to propagate first though just in case! 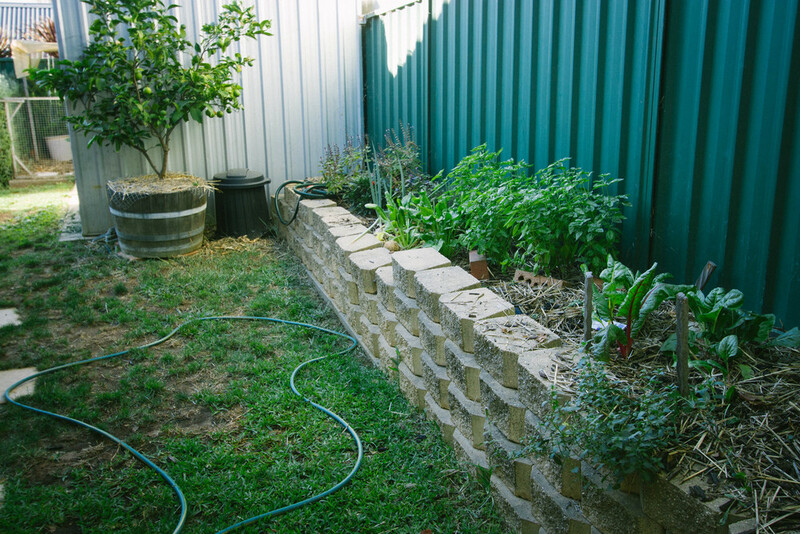 The bees having been loving the Bush Basil, highly recommend it for anyone looking to attract bees to their garden. My other little 'Zone 1' area to the side of the house has also fared really well - my Rainbow Chard has started to look more spritely, and the basil has been going nuts. I've saved some seed from the Purple Thai Basil for next year. My lemon lime tree has a few burnt leaves, but managed to retain 90% of the fruit set through the worst of summer, so I'm crossing fingers for lots of limes this year. Some of you have asked me after the last few Garden Share posts about various things in our garden, like bricks and random sticks and netting...well, let me introduce to you the reason for those things. Internet, meet Amy. Our little garden tornado. 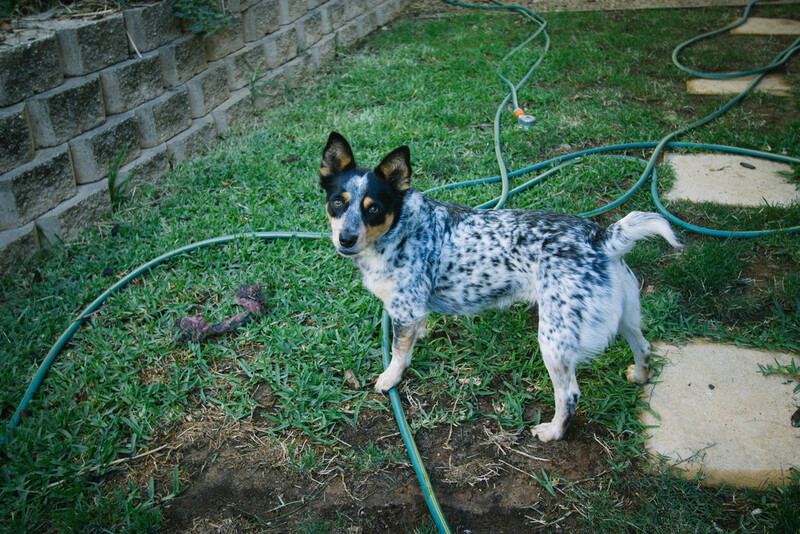 Nothing, and I mean nothing, gets between this little ratbag and her ball or rope toy, so every new plant that gets put in the ground gets paired with some type of barrier - this mostly works. She's too cute to get angry at though, so we persevere. I held off on planting lettuce seeds in February, so that'll be on the agenda for this month. 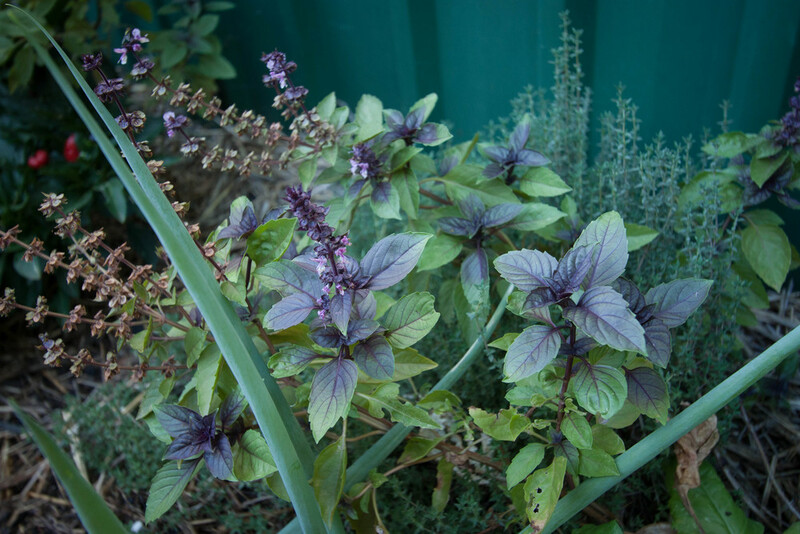 I'll be looking to take cutting of my Bush Basil, Pineapple Sage, Lavender and Thyme this month too. Chillies, spring onions, basil, perpetual spinach, rainbow chard, thyme, rosemary, chives, tomatoes, zucchinis. Tidy things up - pull out the dead tomato plant, and possibly the pumpkin vine (if I can bear to!). Fertilise everything with some Uplift and buy some new mulch to top up some 'fallow' areas with. Keep an eye on the beans - if they look like there's not going to be any pod development, they are coming out. In a couple of days time, I'm going to share with you some pics of the reason there's not much up there on my 'Planting' list...stay tuned. Thanks for visiting my garden this month, make sure you leave me a comment below so I can come and visit yours!